April 25, 2011 - The first Combat Shadow II for the United States Air Force Special Operations Command has completed its first flight at the Lockheed Martin facility in Marietta. Less than one month after a rollout ceremony for the aircraft’s AFSOC customer the MC-130J has begun a series of flight tests prior to delivery to Cannon Air Force Base, N.M., in September. The new aircraft is based on a KC-130J tanker baseline and will have the Enhanced Service Life Wing, Enhanced Cargo Handling System, a Universal Aerial Refueling Receptacle Slipway Installation (boom refueling receptacle), more powerful electrical generators, an electro-optical/infrared sensor and a combat systems operator station on the flight deck. In-line production of this configuration reduced cost and risk, and fully supports the required 2012 Initial Operational Capability date. 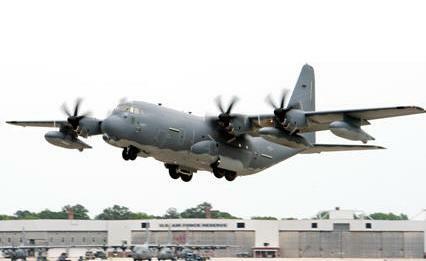 Lockheed Martin is contracted to build 15 MC 130Js to begin replacing the current aging fleet. The U.S. Air Force is authorized to acquire up to 20 MC-130Js against an approved requirement for 37. Beginning in 1997, studies of the vulnerability of the non-stealthy MC-130 force reflected concerns about its viability in modern high-threat environments, including the prevalence of man-portable air-defense systems ("MANPADs") in asymmetric conflicts. At least two studies were conducted or proposed to explore the prospect of a replacement aircraft (known variously as "MC-X" or "M-X"), with USAF at that time hoping for an Initial Operating Capability date of 2018. One analyst questioned the survivability of slow non-stealthy platforms such as the MC-130 in future threat environments in a 2007 presentation to the Center for Strategic and International Studies, and stated his opinion that development of a stealthy replacement for the MC-130 is a "strategic priority". The U.S. Department of Defense's 2006 Quadrennial Defense Review Report also recognized the concern, asserting DoD's intention to "enhance capabilities to support SOF insertion and extraction into denied areas from strategic distances." Despite these concerns, the USAF decided to proceeded with modernization of the current force. The Air Force has stated it desires 37 MC-130Js to replace its MC-130Es and MC-130Ps, which are 40 or more years old. Based on the KC-130J tanker operated by the United States Marines Corps, the new MC-130J has added features for both combat search and rescue and special operations missions. The HC-130J and MC-130J both use the KC-130J tanker as a baseline, but with major modifications to the Block 6.5 KC-130J. The MC-130J adds an Enhanced Service Life Wing, an Enhanced Cargo Handling System, a Universal Aerial Refueling Receptacle Slipway Installation (UARRSI) boom refueling receptacle, more powerful electrical generators, an electro-optical/infrared sensor, a combat systems operator station on the flight deck, provisions for the Large Aircraft Infrared Countermeasures System, and armor. Production of the first MC-130J Hercules aircraft was started at Lockheed Martin’s facility in Marietta, Georgia, on October 5, 2009. Lockheed Martin will build an MC-130J tanker version for Air Force Special Operations Command on its standard C-130J production line. The MC-130J Combat Shadow II is the first C-130 specifically built for special operations, making it lighter and more efficient. Most special operations aircraft are modified after production to accommodate special operations missions.